I colored this water can image with Copic Markers at a "class" given by Deborah Saaranen at the UP Card Gathering. I learned so many little tips from Deb and I was very pleased when I finished with it. Then we went over to see Sharon Johnson and she gave us some great hints on how to make our card making quicker and easier. So, when Sharon announced today's Stamp Simply Challenge, I decided that if I added a sentiment about friendship, the card would qualify. Hop on over to Sharon's blog and read about the challenge. Be sure to check out the other cards that the DT has done too. Paper and Ribbon were furnished by Sharon Johnson. We used the Bow Easy to make the bow. The stamp set is from Our Daily Bread. This is just lovely Joan! I love that fancy schmancy bow!!! 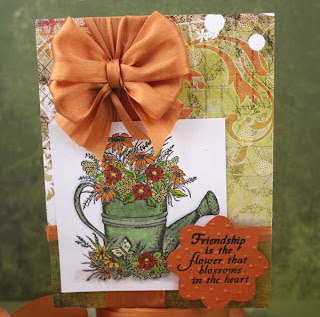 I agree with Julie... LOVE the fancy-schmancy bow and the coloring on the watering can is amazing! Wow! Your card is gorgeous! Love the fantastic job you did of coloring the water can & flowers! The bow is truly "fancy schmancy"! TFS! What a gorgeous creation Joan!! Your coloring looks awesome and of course like the other girls said, LOVE that fancy schmancy bow!!! Beautiful!! Oh, my, oh my did you make a gorgeous card!!! I so fell in love with that exquisite May Arts ribbon, and I, too, found Deb's Copics tutorial so beneficial.